Comet 41P/Tuttle-Giacobini-Kresák shines a brilliant green in this photo by astrophotgrapher Chris Schur on March 24, 2017. The comet made its closest pass by Earth on April 1. A comet whose identity took nearly 100 years to pin down is making its closest approach to Earth today (April 1), just in time for April Fools' Day, but this is no cosmic prank. It is the comet's closest Earth encounter in more than 50 years, and maybe more than a century, NASA officials said. At its closest point, the Comet 41P/Tuttle-Giacobini-Kresák will be about 13 million miles (20.9 million kilometers) from Earth during its flyby, making this encounter the comet's closest pass by Earth since it was first sighted in 1907, according to NASA. Weather permitting, the comet should be a good target for skywatchers with binoculars or a telescope. The Slooh online observatory tracked comet 41P late Friday (March 31) with remotely operated telescopes, showing the comet as a green object in the night sky. You can see a video of Comet 41P as seen by Slooh here. Comet 41P/Tuttle-Giacobini-Kresák is named after its three discoverers —Horace Tuttle, Michael Giacobini and L'ubor Kresák — who tracked the comet separately over nearly a century. Tuttle first spotted the comet in 1858, when 41P was first identified as a sun-orbiting (or periodic) comet, NASA officials wrote, citing the Cometagraphy website by Gary Kronk. But the length of the comet's orbit was unknown at the time. 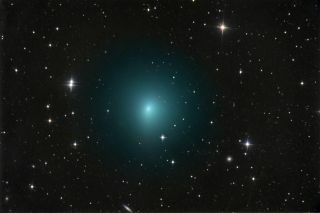 Comet 41P was rediscovered in 1907 by Giacobini, but still not tied to the object seen by Tuttle in 1858. Another astronomer, Andrew Crommelin, later linked the two observations by Tuttle and Giacobini and predicted Comet 41P would return in 1928 and 1934, but the object went unseen, according to Cometography. It wasn't until 1951, when Kresák spotted the comet and linked it with the earlier observations, that Comet 41P identity was officially pinned down. According to NASA, Comet 41P is a member the Jupiter family of comets and orbits the sun once every 5.4 years. Astronomers will track the comet during its flyby to learn more about 41P and its counterparts. "An important aspect of Jupiter-family comets is that fewer of them have been studied, especially in terms of the composition of ices in their nuclei, compared with comets from the Oort cloud," said Michael DiSanti of NASA's Goddard Space Flight Center in Greenbelt, Maryland in the agency's statement. DiSanti will be using NASA's Infrared Telescope Facility in Hawaii to observe Comet 41P tonight to learn more about the comet's composition, as well as how fast it rotates among other details. He'll also be looking for any signs of outbursts, which can offer a clue into how active the comet is. "Comets are remnants from the early solar system," DiSanti said. "Each comet that comes into the neighborhood of Earth gives us a chance to add to our understanding of the events that led to the formation of our own planet." Editor's note:If you capture an amazing photo of Comet 41P/Tuttle-Giacobini-Kresák through a telescope and would like to share it with Space.com, send images and comments in to: spacephotos@space.com.